Myth and Prosthesis I: Do robots have an Ethnicity? In the era of cogitive capitalism, our relationship with technology defines connections between body, mind and reality. In who’s image are body-technology integrations being designed? What are the mythologies that inform those integrations? Do robots have an ethnicity? What is the place of non-Western cosmologies in the development of new technologies? 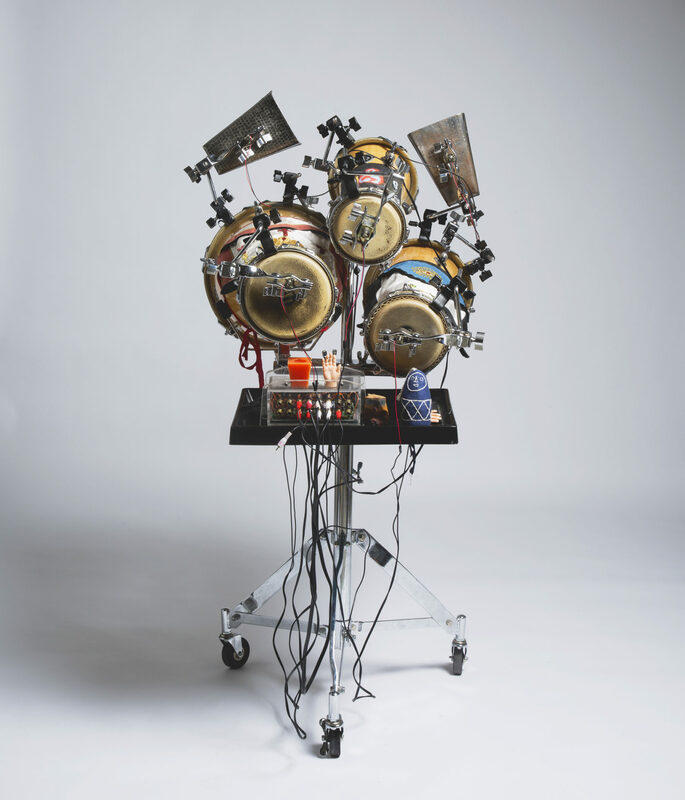 “Myth and Prosthesis I: Do Robots have an ethnicity?” is a sonic sculpture that improvises with a Latin American logic of rhythm. It is an assemblage of personal Western and non-Western cultural referents that are at the same time foreign and native to me. In this project I wanted to show that there is a mythology behind Western technology, and that there are technologies that come from non-Western mythologies. The mythologies of modernity depict technology as universal, a-historic and a-political. But the reality is that modernity has a political agenda that drives the development of new technologies. For example, contemporary music software is generally informed by the in the Euclidian plane: like in Western music notation, there is a single grid in which time flows from left to right, and there is a single metronome/clock that acts as a conductor. The brain of this sculpture is a software with 6 independent clocks and that are constantly moving. 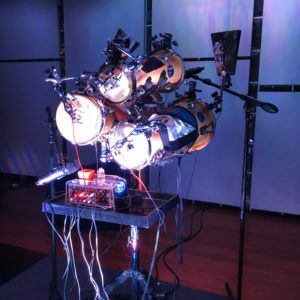 The sculpture produces polyrhythms with a generative algorithm inspired in a Latin American music logic. 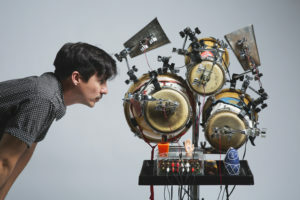 The percussive motors hit a set of Batá drums, used in Santeria/Yoruba rituals. I am not a Santeria practitioner, but as a Peruvian musician I have been surrounded by its influence musically and culturally. The choice of Batá drums is an intentional reference to the neuro-spiritual technologies of trance religions. 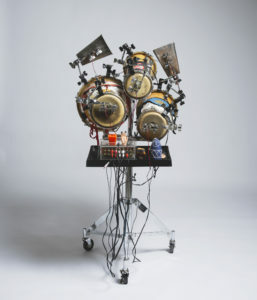 In Santeria, drums are a technology that modifies the body and mind through trance. The dancing body is a producer of knowledge, as opposed to the modern project where technology and knowledge are opposed to embodiment. I am interested in a body-tech integration broader than the patriarchal and Western notion of body. The sculpture also carries garments that my father and grandfather used in their Rosicrucian and Masonic rituals. Both Freemansons and Rosicrucians wanted to erode the division between spirituality and technology. I also added objects and symbols of a mythology invented by myself. As a Latin American artist, I am at the cross roads of modernity and tradition. Western technologies, Santeria, Freemansonry and Rosicrucianism are all foreign and close to me. This sculpture brings together all of this referents as an essay or altar dedicated to a utopian future, where all of these traditions can dialogue in a more egalitarian way. Harvestworks New Works Commission & Residency 2018. Running Towards The Sun: Guadalupe Maravilla, Grace Rosario Perkins, & Efraín Rozas. Curated by Allie Tepper. Jack Barrett Gallery July 10- August 15 2018. Installation at my own home. Attendants were allowed to enter the sonic meditation space one at a time. They were left alone with the robot which improvised in real time for 20 minutes. 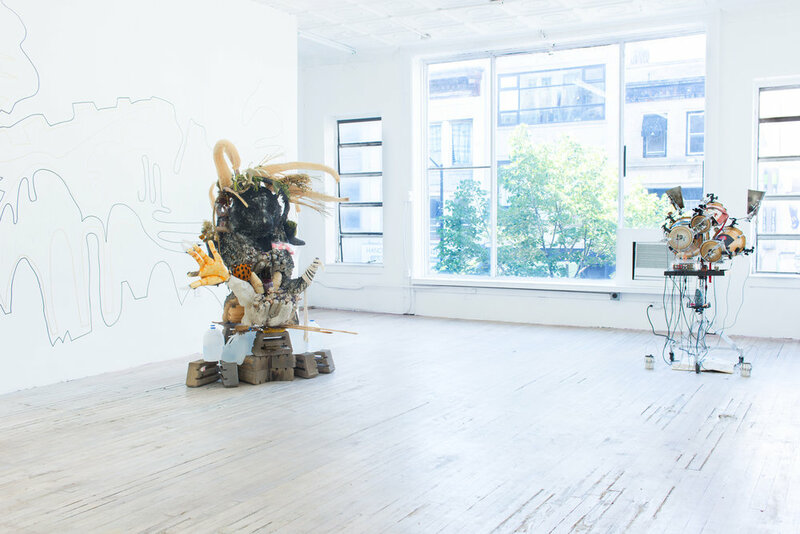 One of the sessions was live-streamed for Radial Gallery, which only exists in the internet. 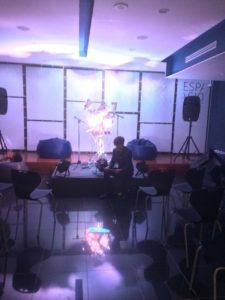 The audience sat in front of the robot which improvised in real time for 30 minutes.